Cincinnati circa 1905. 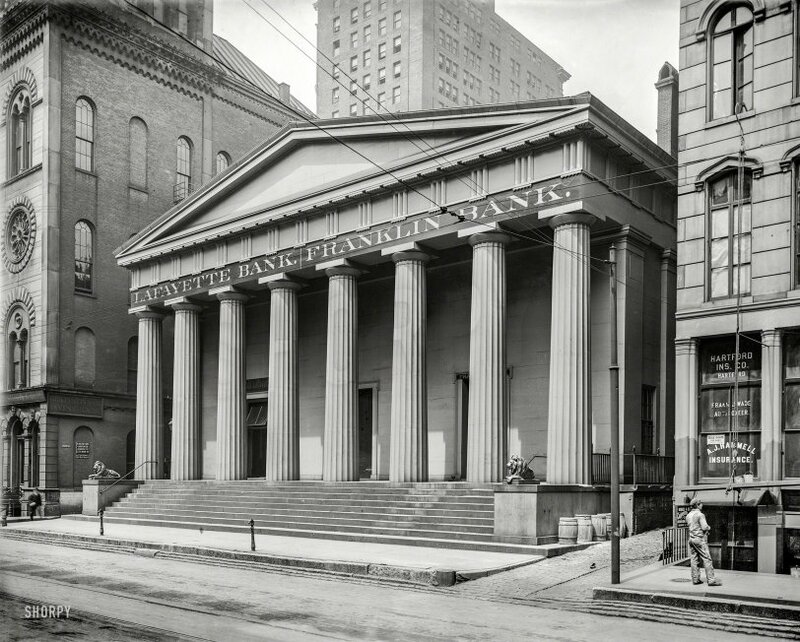 "Lafayette and Franklin Banks, Third Street." With a painter and a window-washer in supporting roles. 8x10 glass negative. View full size. Submitted by lindab on Tue, 05/17/2016 - 12:57pm. that there was a scenery painting studio in the second floor of the bank building, with all that great daylight from the glass dome. TTerrace, I think that the "chicken" is actually a boot scraper, to get mud and horse dookey off before going indoors. A boot jack is to help remove your boot from your foot. Submitted by Hoosier Ron - in... on Tue, 05/17/2016 - 10:12am. Before anyone complains that there is no window washer, I had to look long and hard to find him. He is death-defyingly way up in the top of the picture. 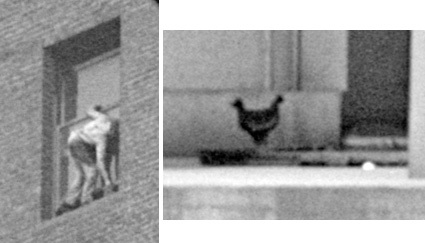 Also, I'm sure it's not a chicken in the middle of downtown Cincinnati but, that sure looks like one at the bank's door. Perhaps she puts all her eggs in one bank. Submitted by bobstothfang on Tue, 05/17/2016 - 4:32am. An old Cincinnati City Directory lists the Franklin Bank at 124 E. Third St. Just about everything on Third Street has been replaced with new modern buildings. 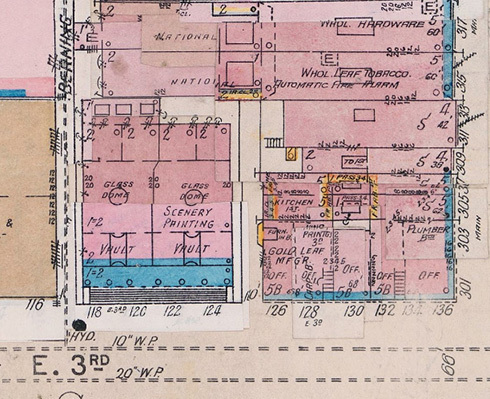 Here is an old map section of this area that clearly shows the location and interior floor plan of the two banks in the structure. Bank Alley to the left of the bank appears to have been renamed "Berning (Bank) Alley" on the map and the alley still exists on Google maps today and it is now called Berning Place. Everything shown from Berning Alley to the corner of 3rd and Main is now a parking garage.